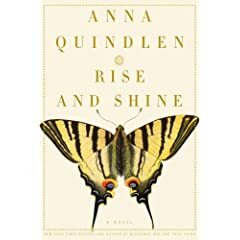 Rise and Shine by Anna Quindlen - what a crowded novel. I enjoyed the packed-to-the-rafters issue-of-the-week approach, in kind of the same way as I enjoy doing all my sudoko-a-day calendar puzzles in one lunch hour after I return from a week's vacation. When was the last time I had a week's vacation? Sometime before the turn of the milennia, surely. So, like Quindlen, I digress. Interesting how, in our current FCC inspired media persnicketiness, Quindlen's avoiding mention of the obsenity that gets Meghan booted, even though as long ago as 1984 it featured pretty prominently in a PG-13 movie. Is it okay to write but not to say? Or is there some façade of politeness to be maintained here? I personally think profanity is usually the sign of a poorly developed vocabulary, but I sound kind of silly swearing so I'm biased. One of my favorite characters here is Tequilla, who seems like a distant relative of Lula. Watch for her and be amused throughout the story. Be warned, the story doesn't end with a happy ending, but instead has a loose-ends-dangling, a few sad moments, and life-goes-on mojo. Not unlike real life, actually. I'd recommend this read to most of my friends. I'm in the midst of this one and am really enjoying it. It really does have a fast-paced NY feel. Good review!